How clean are your offices? Are you using standard chemical cleaners to get the job done only to find out you’re spending way too much money? With MonoFoil, you’ll be on your way to using cost-effective cleaning products that do a better job and keep your spaces truly clean. MonoFoil is unique because “all MonoFoil Antimicrobial products utilize silane technology that “electrocutes” the target organism on contact.” Your business will benefit in multiple ways with MonoFoil products and their Clean Certification. Unfortunately, “bacteria, virus, fungi and mold are everywhere - in the air, on our bodies, and on our products and equipment.” The more the bacteria present in an office setting, the higher chance of employees calling in sick. MonoFoil prevents mold, mildew, fungus among other growth, therefore protecting an environment so that there’s less sick leave! But can a cleaning product be that effective yet still safe for employees? Absolutely! MonoFoil products do not irritate human skin and they are bleach free. Offices and desks remain treated in addition to those frequently used meeting room tables (without the chemical odor)! Learn More About Our Quick-Killing Technology at the link below! Mainstream cleaners are used frequently, needing replaced more often, which burns holes in pockets! Compared to chemical cleaners, MonoFoil “requires 90% less product, and takes 99% less time to apply over time.” Less product means less money spent to replace cleaners. Less time means more time to focus on your business goals! It also might mean less money less money out of your pocket, if you’ve hired someone to do the cleaning. MonoFoil is more effective, cost-effective, and time-efficient. With MonoFoil’s Cleaning Certification, you will get the most out of the cleaning products. MonoFoil’s Application Services is a quick way to get the clean that so may other businesses and municipalities enjoy. 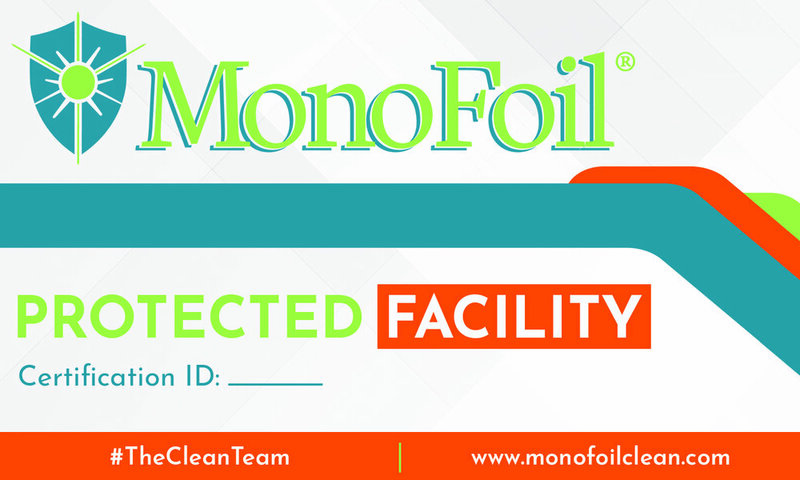 Not only will you get a certification ID number as well as a sticker you display that number, MonoFoil 100% backs up their application services so you get a perfect germ eliminating barrier every time. Contact MonoFoil to get a free estimate on our Clean Certification program. All of our professionally treated facilities receive this sticker to help your customers and employees feel confident in their cleaned environment. No need to worry about your office environment with MonoFoil’s bacteria-killing technology. It’s safe for your employees and for your clients, leaving spaces fresh without a chemical odor! Even during flu season, MonoFoil products help prevent sickness from spreading which results in less employees calling off. Already partners with MonoFoil customers such as MGM Grand and The Walt Disney Company, MonoFoil invites you to join in taking this step to increase your business! Share it with the world on Social media! Thanks so much!